Travel. With a Toddler. By myself. I was lucky enough to embark on a planned trip so that Luke and I could go visit Dad/Brian where he is working. It was just the two of us. You know how there is that saying, “three’s a crowd”? Well, it wouldn’t have been. In fact, it would have been downright heavenly. But I digress. Friday morning, with the help of Sprout, the Sunny Side Up Show, Caillou, a broom, a Swiffer, a dustpan and some luck, I was able to get both of us dressed, packed, fed, and ready to get in the car to head to the airport a full 30 minutes earlier than my guesstimated departure time. I actually had us both ready by the time I was shooting for, which almost never happens. So we were on time/early. Then, the fun began. “Mama? I pooped.” Okay, no big deal, I think. At least we’re not at the airport. Ten minutes, a bunch of wipes and a new diaper later, we are off. We park in economy parking, because let’s face it, we have still not won the lottery, and I pack the cheap, creaky umbrella stroller to the brim. Luke is in it, his super cute SkipHop elephant backpack (thanks Uncle Michael!) is hanging on the bars, Brian’s giant Cal swim team backpack is weighing me down on my back, my purse is on one arm and the car seat is upside down hanging off the back of the stroller bars. I feel good. I feel proud. I feel a bit like Supermom (my friend Tricia knows a bit about this feeling). So we walk to the terminal instead of taking the shuttle, because I’m not sure we’d make it on and off the shuttle in one piece and I want people to be able to admire my genius. Since we’re early, and the child is tightly secured with little chance of unentanglement, I hit the restroom before the security line, because I’m guessing this will be my last chance before landing and getting picked up at our destination. I wheel us in to the handicapped stall (I feel like I won’t be judged too harshly, but what do I know?) and relieve myself in relative comfort, compared to last year at this time when I went to the bathroom while Luke was strapped to me in my front carrier. By the time we reach the security line, I am sure that it is shorter than it was when we went in, and I am feeling validated for my choice. Then three TSA agents leave, and only one comes in, and I realize I might be wrong. After acquiring both items, we head back to our gate to find the perfect seat away from people, just to have some single, oblivious man swoop in and steal it from us. So we turn and find the next best thing, a row of seats near an older couple who smile sweetly as we venture closer. I remove my backpack, our quesadilla and smoothie, and bag of liquids to be screened, which were still somehow in my hand, and unbuckle Luke who is begging to sit in the big seat like a big boy. Before I can help him, he has his feet stuck in the foot pad at the bottom of our cheap umbrella stroller, has tripped and has fallen over his own feet in between the stroller and said big boy seat. Since his 32 pounds have been freed from the stroller, the stroller then tips backwards, sending my purse, and Luke’s elephant backpack sprawling across the airport floor. While I help Luke out of the stroller’s grasp, and then retrieve all of my personal items as the lady overhead says, “Please do not leave your personal belongings unattended,” the sweet, older couple stares and smiles and then laughs at what apparently is the funniest thing they have seen in years. I feel a bit like Reagan Brinkley in this week’s Up All Night, without the awesome backing of husband Chris. Since we were flying Southwest, we “preboarded” after the A group, so as not to bother the business types (like my dad who probably wouldn’t mind boarding after all the families with screaming children so they can sit as far away as possible, but again, what do I know?). I completely forget to get a gate check ticket for the aforementioned cheap umbrella stroller (not so much the Supermom here), so we held up the line while Cranky Crew Member got it for us and Happy Crew Member gave Luke his first pair of wings in an effort to help us detour around a Major Meltdown. It worked. And by the time we got down to the end of the jetway, there were still people waiting to get onto the plane, so I silently cursed Cranky for making me feel unnecessarily guilty. The flight itself was great. The only thing remotely eventful was our neighbor. When she sat down, I noticed a bit of eau de alcohol emanating from her general direction. When the attendant came for our drink orders, Neighbor wasted no time ordering a Chardonnay. By the time we received our water, and I had helped Luke find the end of the straw, I turned back to see an empty glass in front of Neighbor who had her purse in her lap, and was popping three rectangular pieces of gum out of their blister pack and straight into her mouth. This transpired over a period of maybe a minute. She spent the rest of the flight jiggling her legs up and down and flipping through and re-flipping through this month’s Skymall. We sat behind the wing so we could watch the wing and the flaps during take off and landing, but still see around it during other times. There was no napping for either of us, but we did catch up on some magnetic drawing that we were behind with, and we invented a new game, to go along with the ones we learned last year, called “skewer the hollow cylindrical ice cube in the cup with your tiny drinking straw without getting so frustrated that you throw down the straw, cup, ice or water in frustration”. It was fun!! When it was time to disembark, we waited until it was clear of passengers, because I pride myself on being patient, and not being an idiot, and I followed Luke down the aisle while I carried the giant backpack on my back, elephant backpack and purse on my front, and car seat on my arm off to the side over the seat backs (that explains the shoulder pain!!!). It was around row 14, that he decided he wanted to climb in, get comfy, buckle up and yell “I’m ready!!! !” Friendly Clueless Attendant smiled at him, asked him to come out, and then had Resourceful Attendant call his name over the PA. When that didn’t work, Friendly Clueless Attendant the 2nd offered him cotton candy as a bribe (really???). Finally, Resourceful came back and looked at Clueless 1 and 2 and said, “Why don’t I take that car seat from you, so you can remove your son?” Genius. Ten minutes after the plane was emptied of all but two passengers, we found ourselves on the jetway, piling up all of our stuff again on Good Old Cheapy. Exhausting as it was, seeing Brian’s face and watching Luke jump out of Cheapy to get to Dada, made it all worthwhile. Hopefully, there will be no need for a post for the return trip. I'm a wife, mom and kindergarten teacher . A daughter and sister and granddaughter. A friend, a confidante...(I used to watch Golden Girls with my Nana all the time when I was little). And it's so nice to walk into a place where everyone knows your name (and I used to pretend I was sleeping on the couch so I could watch Cheers). This entry was posted in drama, travel and tagged awesome people, crew members, patience, plane flight, toddler, wings. Bookmark the permalink. 4 Responses to Travel. With a Toddler. By myself. You are a far far far braver woman than I. It’s not a vacation – it’s an ADVENTURE! Yes, but Tricia, I only have one, and I am pretty sure you will not be taking only one somewhere anytime soon. But thank you. love this! 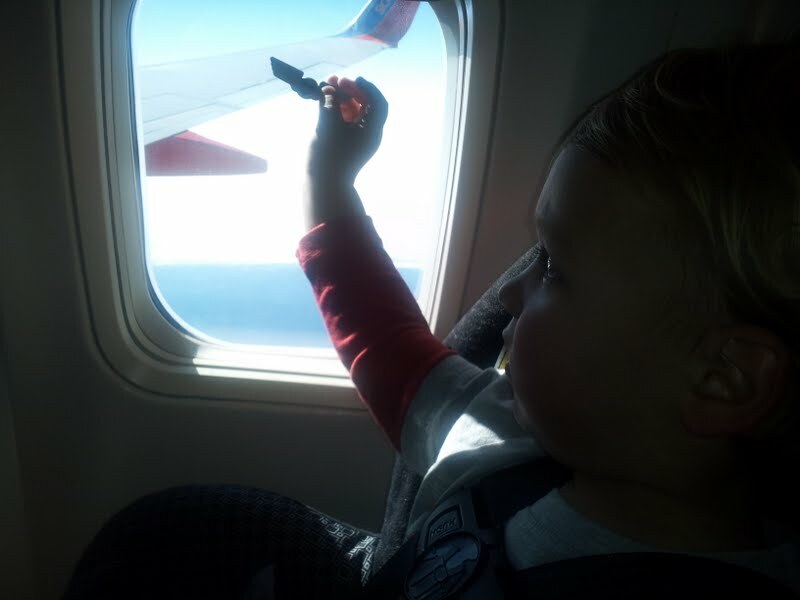 i could relate back to the “old days” of travelling with little boys! love your writing …so funny i laughed out loud!